Enjoy JUST MILK any time, any place, anywhere! Whatever you’re doing, travelling is the perfect time to enjoy being with family and friends, taking time to have fun together and enjoy long dinners. It is also the perfect time to eat healthily, and to do some sport. Don’t forget to add JUST MILK to your shopping list when you’re on the move! Heat-treated without the use of additives or preservatives it provides the same amount of calcium as fresh milk but simply lasts much longer. It can be stored for up to 3 months, so you need never run out of milk again. 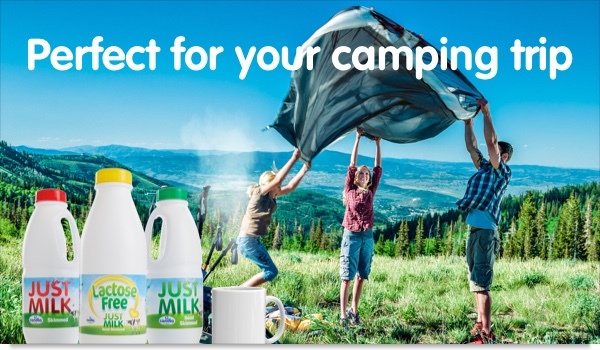 Anywhere, while camping, caravanning or at home, you will enjoy JUST MILK in your tea or coffee, or in your cooking.